Damn! How could it be nearly 4pm, 3:55, and we were still not in the arena? My wife, Lynn, daughter, Sierra, and I had left our house over six hours earlier. More than enough time to reach BC Place, a mere 110 miles from our starting point. Ok, that didn’t count the ferry trip, as we were on Lopez Island, in the middle of the Straits of Juan De Fuca, 75 miles northwest of Seattle, but the boat ride lasted only 45 minutes. Yes, a 13 mile drive preceded the ferry leg, and yes, we had to make time to park our car so we could simply walk on the ferry. Yes, the 10:45 a.m. ferry left Lopez late and arrived late to the mainland, and when we reached the Anacortes dock we couldn’t escape the bottleneck on the exit ramp created by the mass of fellow walk-on passengers, laden with children of all ages, pets, suitcases, and coolers, who were in no mood to hurry up and end their Independence Day holiday weekend. Yup, we had to hike to Sierra’s car, parked well beyond the terminal in the lot of a restaurant that had closed in the Great Recession and now sported a forlorn, wind-battered ‘for sale’ sign. Whew, all that got us to just before noon. We had four hours to drive 97 miles. Piece of cake. Yes, there was the small matter of crossing the border, but surely the Canadians were prepared for the onslaught of Americans heading north to cheer on our team for the World Cup, right? Because, of course, that’s why we were prepared and eager to travel hours and hours. Determined to see the best women’s soccer in the world, every one of the ninety minutes of 2015’s final match, up close and personal. And even though we don’t know any of the players up close and personally, we took the U.S.A.’s 2011 loss to Japan up close and personally. We were determined to do our part to create a different outcome. The memory of that game still stung. 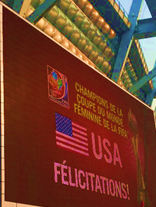 We’d not forgotten the sense of frustration and impending doom that built through that match as the U.S.A. could not assert a firm toehold on the game and put itself in control. The agony of witnessing the team’s meltdown in the penalty kick play-off was not an experience we sought to repeat. This time, we would help that not happen again. We would show up and cheer our team on, offer our little bit of wild noisemaking, clapping, yelling, foot-stomping, flag-waving (okay, that admittedly doesn’t make much noise, but it does create some wind action) to help usher in a different outcome. 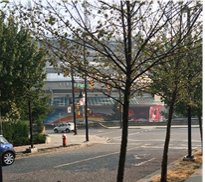 Of course, we lost a bit more travel time by stopping at two drugstores in our search for face paint, as we did have to prep for our arrival at BC Place. Yes, we were sporting red shirts, Lynn had a red, white, and blue spangled lei and Sierra and I had appropriately colored USA soccer scarves, all three of us had nice-sized American flags to wave, but we needed a little more to confirm our allegiance and identity as rabid USA soccer fans. We simply had to stop. But we were quick. Mere minutes. Of course, there was a line at the check-out, and those checkers are NEVER in a hurry. But whatever, at that point, we believed we had time. Alas, the Canadians were not prepared for the onslaught of Americans heading north over their border. When we reached the line of demarcation just after 1pm, the line of traffic stretched beyond the sign alerting drivers that the border was a half mile away. By my calculation, I figured there were about 300 cars ahead of us. Canadian Border Control predicted our wait would last 50 minutes. If there were five lanes of customs officials, that would be 60 cars each, average of one car per minute. That seemed entirely reasonable. Perfect! Enough time to paint our faces without having to rush. All good. Sierra pulled out the paint and put her Studio Arts degree to work, decorating our faces with shooting stars and stripes, all in the good ol’ red, white, and blue. 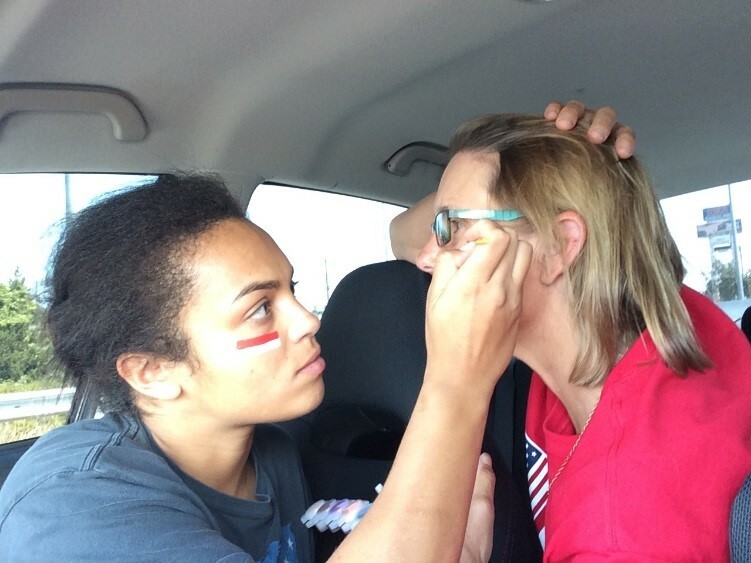 Yes, she was sitting in the front passenger seat of a Subaru, but she had no trouble applying paint to everyone’s cheeks, deliberately and expertly. 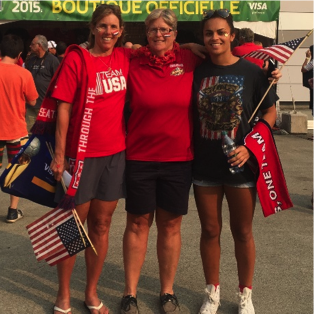 Thanks to her efforts, we looked like the rabid, die-hard U.S.A. fans we were. I could feel my back teeth getting sore, a sure sign I’d been clamping down on them way too hard, to ensure I wouldn’t open my mouth and say something I’d regret quickly. Grrrr, but I wasn’t bitter, oh no. It was just about three o’clock, and we had a sweet hour to drive the last 23 miles, pull into a parking lot, and get to our seats. No sweat, right?! WRONG! The driving was fine, traffic non-existent until the last half mile. By now, it was about 3:37 pm. The parking search? An utter and complete DISASTER. Who has ever heard of a parking lot that stays open and allows cars to enter when it is completely full? Well, apparently that happens in Vancouver, at least in one location. Several unsuspecting drivers, including ours, drove into what turned out to be a tiny underground lot that dead-ended after a couple of turns in an area that barely allowed even one car to turn around, much less the half a dozen or so that had all driven down to what we thought was parking nirvana but turned out to be parking armaggedon. We managed to hightail it out of there, the tension in our car starting to build, game time less than fifteen minutes away. We had no idea where to go. There were no “P” signs to help guide us; the one traffic cop I leapt out of the car to beg for guidance pointed vaguely up a street that led away from the arena. We tried various ways to soothe ourselves and each other. “The game probably won’t start at 4pm. That’s when they’ll start introducing the players,” speculated Lynn. Sierra admonished me not to say anything negative, as I whined, “I didn’t come all the way up here to miss the game.” “You’re stressing me out, don’t say that!” my daughter instructed, so I buried my head in my arms and tried some deep breathing, but I was feeling desperate and fury was beginning to grab hold of my psyche. We drove past the arena, took a right on something called the Georgia Viaduct, a wide boulevard that looked ominously determined to head us out of town. As we approached an intersection on the left side of the boulevard, bisected by a nondescript, narrow street, Sierra peered down it. “I think I see a parking spot, turn here.” Incredulous, Lynn followed her direction, and sure enough, right in front of a tall apartment building’s entry, blissfully empty space beckoned. A disbelieving check of the parking signs assured us the spot was legal. The parking goddesses had turned their beneficence upon us, and we were quick to pay them deep homage, even as we hurtled ourselves out of the car and ecstatically trotted the three blocks to the BC Space, despair and fury left huddled at the curb, abandoned and bereft. 4 p.m. on the dot, we got our tickets scanned and we ran for the interior of the arena. Of course a pit stop was required, after all, we’d been on the move for six hours. It was a soccer game, we could miss the first couple of minutes without fear of missing out on scoring action, right?! WRONG AGAIN! 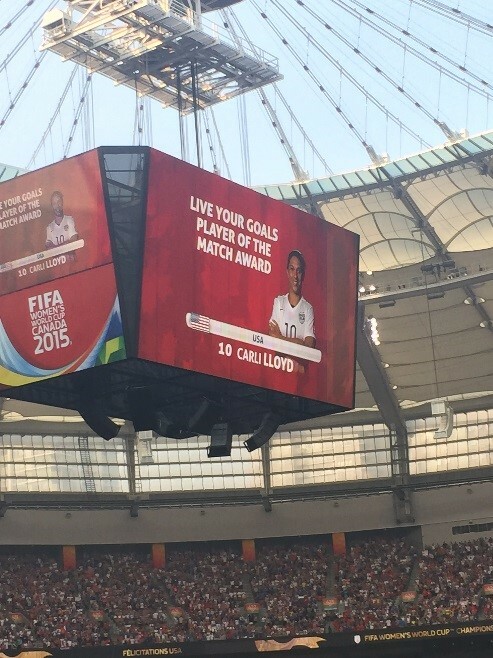 The first Lloyd goal we saw on consecutive television screens as we sprinted to section 148. We saw the replay, too, as we romped by the fast food purveyors, reached our section, ran up the stairs, found our row, and slid into our aisle seats. Was the game worth the odyssey? Absolutely! After the second goal, barely five minutes into the first half, it became abundantly clear this game would be unlike any other I’d witnessed in my nearly twenty years of watching soccer. 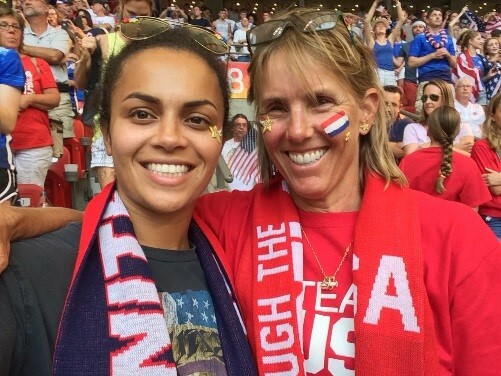 Granted, Sierra, having started her soccer career at the ripe old age of five, was featured in most of the games I watched, but I am nonetheless deeply intimate with the tension that permeates most games, given the rarity of goals and the typically omnipresent pressure to score. Not the case with this World Cup final. Within a handful of minutes, the tension evaporated and the celebration began. Yes, the U.S.A. still had a game to play, and the Japanese did not roll over and die by any means. There were moments of hiccups in the U.S.A.’s play, all was not perfect, but the atmosphere in the arena never approached apprehensive, or even concerned. Nonetheless, in sports, momentum can turn on an unexpected play or a whiff of emotion. Long is the list of sure-things that have been reversed by dogged, won’t give up effort, but in this case, handwriting was on the wall. The U.S.A. team’s early scoring catapulted the game out of Japan’s reach. All we had to do was play defense. Of course, that’s not all we did, as evidenced by the timing of goal #5 in the second half. I loved the entire scene, starting with the fans’ rapturous attention on the players and the game, including my daughter’s pleasure and satisfaction at being part of such a momentous sporting event, and of course extending to the players’ intensity, focus, and athletic prowess. They, too, however, couldn’t deny the score and the lopsided advantage the success of their early attack gave them. Their faces showed their early and abiding confidence in the final outcome and betrayed their anticipatory happiness; how could they not, given the damage they wreaked on their opponent right out of the gate? Was it anti-climactic that the game was basically over in the first sixteen minutes? Maybe to some, but not to me. Not one to enjoy suspense, I reveled in the room for error team USA’s early scoring provided. Watching the game without frantically worrying about the outcome, I loved being part of such a spirited crowd, heavily weighted to the Americans, although amply interspersed with Japan supporters, many of whom seemed to be Canadians determined to level the playing field in the stands. Fans cheered loudly and often, applauding and celebrating more than just goals: shots on goal, saves, foul calls, player entrances and exits, in short they exploited any excuse to make noise. And of course, the outfits, red white and blue everything and everywhere, hot pants, long pants, shorts, skorts, miniskirts, bathing suits and bras, tops, dresses, tights, jackets, vests, scarves, top hats, baseball caps, oversized sunglasses, flags, beads, tattoos, jewelry, streamers, make-up, face paint, sparkles and spangles. Ninety minutes flew by, even interrupted by an intermission. The game ended and the celebration notched upward, if that was possible. 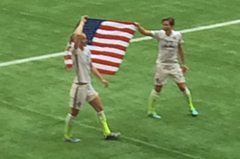 How could you not want to hug Hope Solo, despite her recent off-field poor behavior, or Abby Wambach, whose play may not have been stellar this round, but whose long-standing dedication and superior play positioned the U.S.A. team to win? How could you not want to hoist Karli Lloyd on your shoulders and celebrate her success, or bow down to her for her feats on the field. Really a hat-trick in a world cup final???? It’s impossible to describe the game in hyperbolic terms; that’s how extraordinary it was. Also extraordinary: the size of the audience the event attracted. While 53,000+ crowded into the arena, not an attendance that came close to eclipsing the 90,000 who attended the women’s world cup final in 1999 in Pasadena, that number comprised a tiny fraction of the English speaking audience that tuned in to watch the game. 26.7 million people in the USA tuned in to watch the game (25.4 million on FOX, 1.3 million on Telemundo, the Spanish language station), more than the 26.5 million who watched last year’s men’s cup final, more than the viewership of the 2014 World Series, more than last month’s NBA finals. As a has-been world-class athlete in a decidedly amateur sport who hails from the dawn of the Title IX era, I couldn’t be happier about the well-deserved attention, accolades, and adulation accruing to the 2015 women’s world cup champions. Rare is the sport where women receive comparable attention to men. When it happens, wow, that alone is cause for celebration. 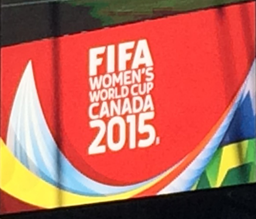 Yay for the women’s world cup finals! Rarer still, is the sport where women receive comparable economic consideration. Tennis comes to mind, and the battle for economic equality in that domain has been fought hard and long by big names, starting with Billie Jean King and extending through the decades to Venus Williams. But tennis lies beyond the realm of other women’s professional sports, on bad days an outlier, on good days a beacon. 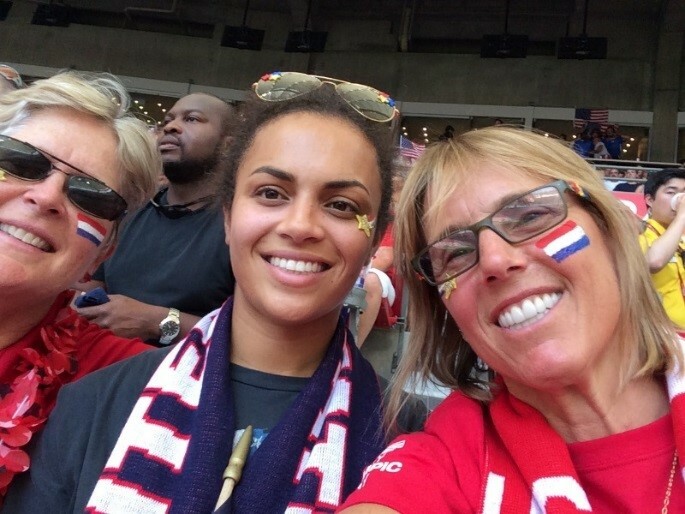 Let’s hope the attention on the 2015 women’s world cup winners will add wattage to that beacon, and make the financial prospects for women athletes across all professional sports brighter by attracting more fans like my family, willing to work miracles to show up for their team. Our culture is slow to adjust to the reality of women as professional athletes, but it’s happening. Ours is not a patient era, but change takes time, as does the bid for greatness. Ask any of those athletes on the field this past Sunday about the disappointments they’ve lived through, the injuries endured, the countless times they’ve not measured up to their expectations or reached their dreams. Ask them how often, in those lonely moments, they’ve had to remind themselves of their larger purpose to stave off despair or resignation. That’s what it takes to be great: a long view and the patient diligence to walk every step, even the ones that seem to head you in the wrong direction. Our USA women’s team hasn’t just brought another coveted trophy back to our soil, but has nudged our country a few steps further down the road to acceptance of women’s professional sports, measured in fan interest and support, buying tickets to games and showing up. That road ahead stretches to the horizon and likely well beyond; the journey is by no means over, but every step forward is one to celebrate. The ones taken this past weekend by our women in cleats were giant ones. As for me, my wife, and my daughter: we’re all grateful we were there to witness history in the making. Nowhere else we’d have rather been, and as fate would have it, we got there just in the nick of time.